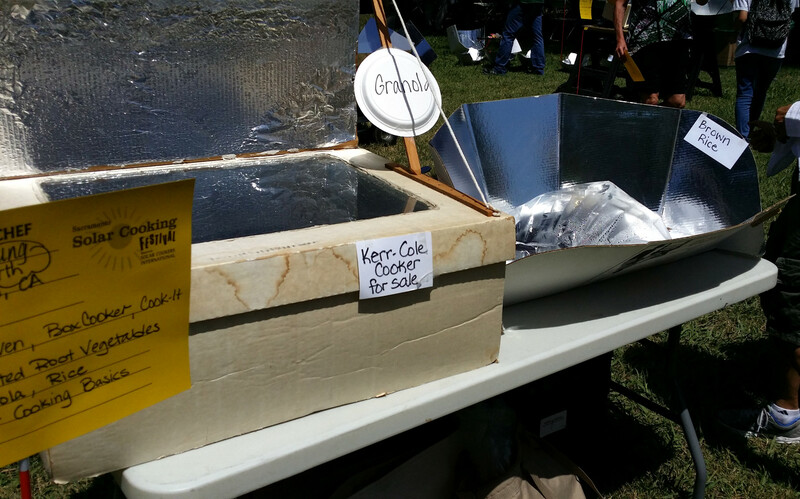 Pass this litmus test and a solar oven can make your dinner, according to one of the solar chefs who demonstrated this past weekend at the Sacramento Solar Cooking Festival, hosted by the nonprofit Solar Cookers International. He was one of about twenty-five impressive solar chefs demonstrating their skills. In the crowd, I spoke with humanitarians, hippies, PhDs, teachers and libertarians—sometimes all in one chef! I met a physicist who had designed a powerful cooker with his graduate students. Another chef had made the long trip from India, where she has taught 500 people in her village to cook with the power of the sun. That’s 500 lives changed (plus family members!). Chefs traveled from all over—Kenya, Japan, Canada, Bolivia and Hong Kong. What was my favorite demo? Boiling water—very exciting for someone who guzzles as much tea as I do. When I first heard about the festival, I though to myself, “Cool! Green cooking! Sign me up!” I also knew that SCI distributes solar ovens to women living in the developing world. By harnessing the power of the sun, these women no longer have to spend hours foraging for wood to build unsafe fires, which pose all sorts of health and fire hazards. Their children, who often spend hours helping to search for fuel, have time to attend school. But I hadn’t given any thought to what solar cookers mean for drinking water. According to Water.org a child dies every minute from a water-related disease. 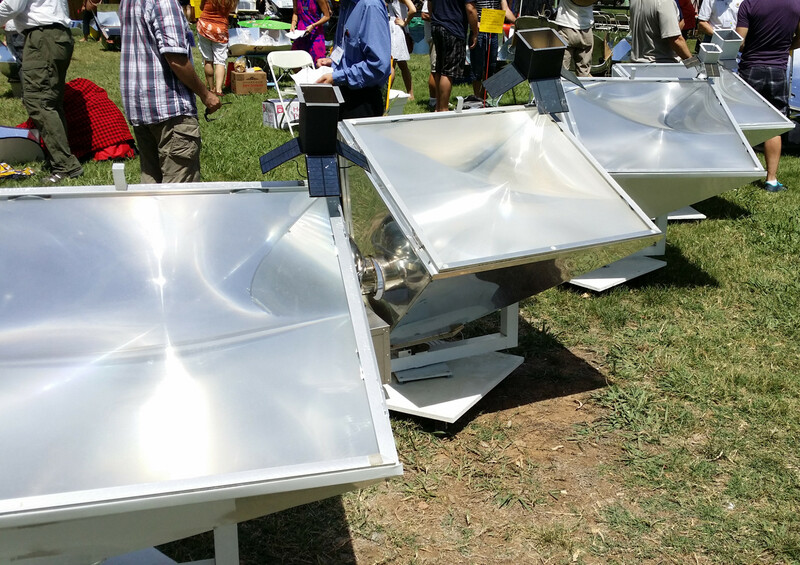 Solar ovens make water contaminated with bacteria and viruses safe to drink. Water heated to 149°F (65°C) kills Hepatitis A. Heat it to 140°F (60°C), and it kills E.coli, Cholera and Typhoid bacteria and the Polio virus. Worms and Cryptosporidium? Dead at 131°F (55°C). Although water need not boil to kill dangerous pathogens, how do you know when it has been heated to a high enough temperature to render it drinkable? A WAPI (water pasteurization indicator), a small, not even 2-inch cylinder filled with wax, tells you. When the wax melts, the water has reached the point of pasteurization. The water might still be brown, but it will be safe to drink. 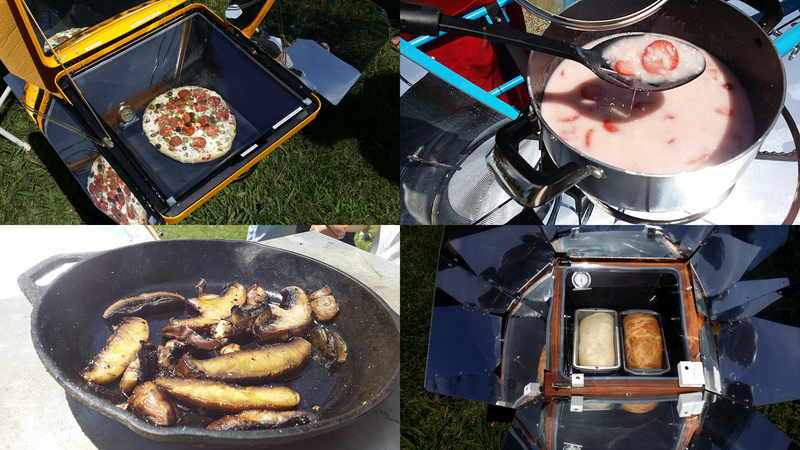 I’m Sold on Solar Cooking but Which Oven Is Right for Me? 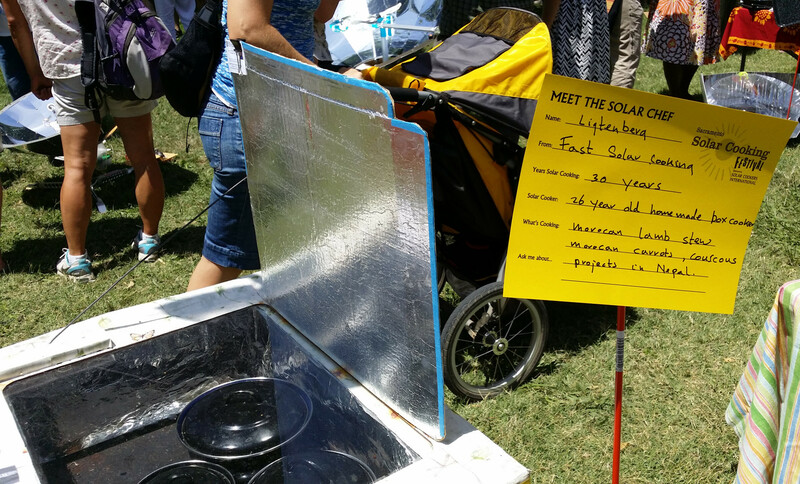 I had hoped to leave the festival with a solar oven of my own. But with such a dizzying array of styles to choose from, I’ll have to do more research. Most of the ovens I saw had internal temperatures ranging from 200°F and 250°F, but some can reach temperatures of 400°F! We want to build a cooker like the above cardboard box cooker above on the left. 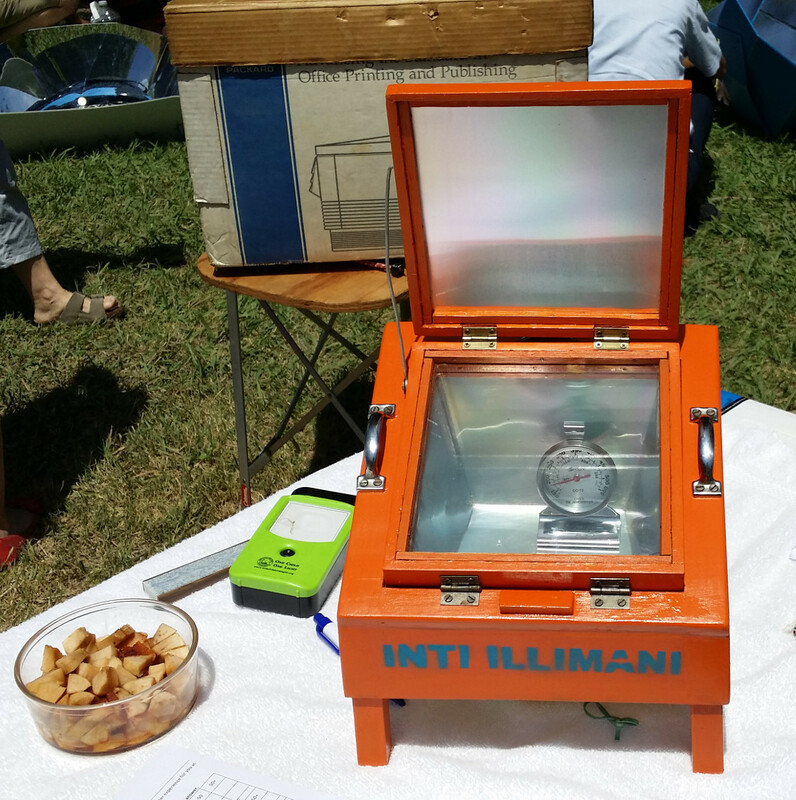 These box cookers (professional and homemade) displayed the highest temperatures. They’re the ones that can hit 400°F. Above is another homemade box cooker, still working after 26 years. And why wouldn’t it? It has no plugs, no internal moving parts and no pipes or tubes pumping in fracked “natural” gas. These high-tech above ovens look too complicated (and I imagine pricey) for a beginner like me. This disco-umbrella-turned-cooker might be more my speed. I loved this little cooker. The chef baked apples in it. I’d like to build one like this. All of the above cookers cost very little. The one directly above resembles the windshield cover I keep in my car. In all of the above pictures, the pots and pans (black to absorb heat) sit inside a plastic bag to prevent the heat from escaping. For us plastic-free types, we can use a large glass bowl. I saw several set-ups with glass bowls but failed to get a good picture. 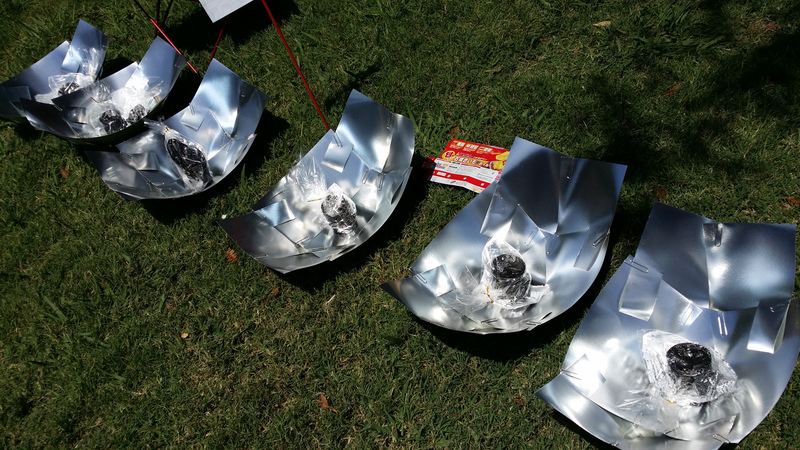 You can make a very simple solar cooker like some of the ones pictured above. The two at the bottom are made from cardboard covered with tinfoil. 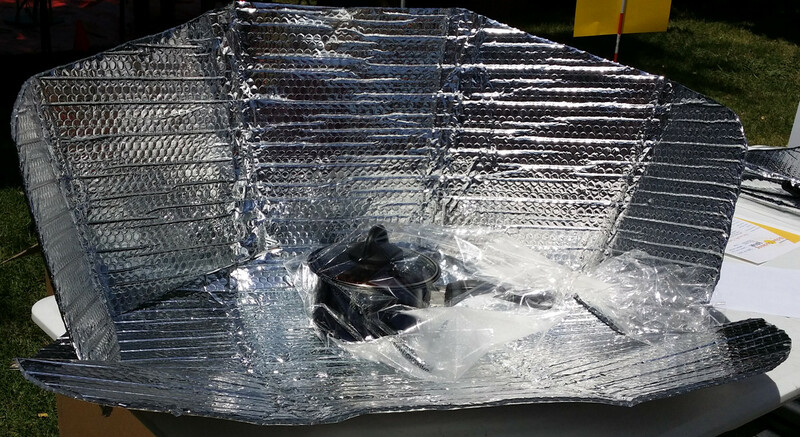 If I’ve convinced you that solar cooking is totally awesome and you would like to buy a solar cooker, please order it from SCI if you live in the US. A portion of their sales funds their amazing work. When I returned home, I found out that our intentional community owns a solar cooker. It’s in storage, so I’ve never seen it. Stay tuned! Wow! How absolutely amazing an awesome. I must admit that I never knew that solar cookers were so widely used. You were lucky indeed to be able to see so many in action from such a vast community of like-minded people. I look forward to hearing how you go with your own version. Thanks for sharing this post! I plan to make a solar oven using a repurposed BBQ. Just waiting for someone to put one out in the street. At this rate it might be next years project now… Would have loved to visit the show! I met a chap who said that the best colour was not tin foil or black but dark green much like plant leaves. Apparently it absorbs the most light. Probably why plants and chlorophyll are that colour. I plan to build a box within the housing that had the burner and insulate the space with a non toxic and heat absorbent material, maybe clay maybe packed earth. Glass layer on the top possibly double, I will experiment. 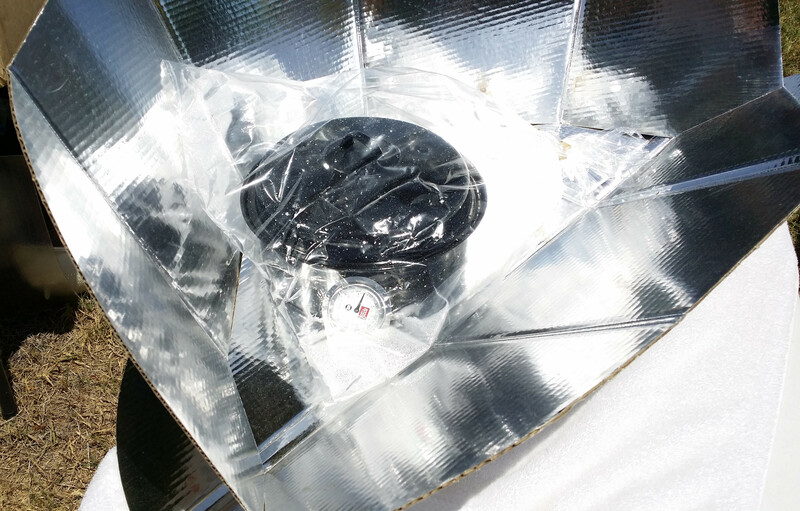 Then I will use tinfoil to make reflectors to channel the sun if needed by weather conditions. I will post details, photos and plans as soon as I get a BBQ. There were so many just dumped last year I am kicking myself for not snagging one! That sounds brilliant! I look forward to reading about it. Could you find a free barbecue on Craigslist? People give all sorts of stuff away on there. 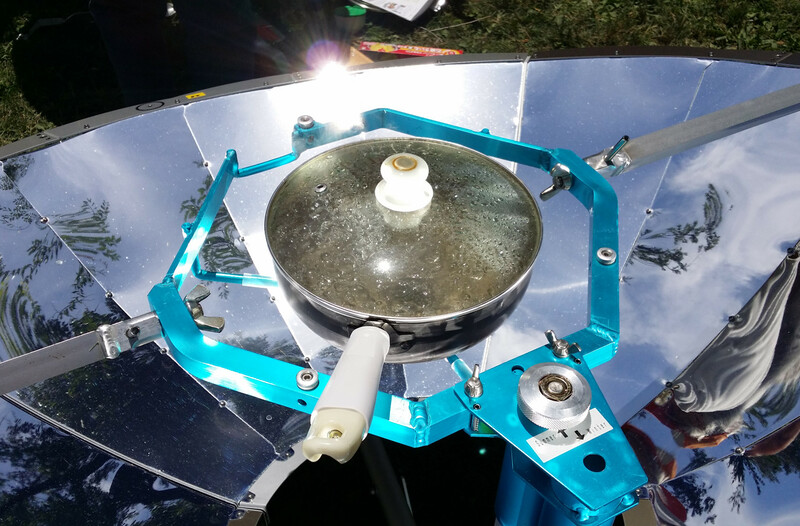 A couple of my friends have solar ovens (one has the water boiling type – looks like a huge satellite dish, and the other has a square one for baking) but to see so many in your blog post took my breath away! So so so cool! I have looked up making one, and thought about buying one but it will have to wait until I have a garden. My balcony doesn’t get enough sunlight or have the space. At the Less is More Festival last year we had demos of the box cooker – we cooked a vegetable slice in it, and it was very nice. And hot! Cool! I can’t wait to try cooking! Thank you so much for your wonderful blog post about our festival! Today I borrowed the Sunny Cooker (the disco-umbrella you have pictured) from the SCI office and I’m in love! They are not currently readily available in the US, but we are working on it! Great compact parabolic cooker designed and manufactured in Japan. Based on your post, I think a home-made box cooker is the thing for you. Can be made out of recycled materials (wood or cardboard) and will heat up to 300-375 – which will allow you to bake bread, cakes, and cook stews, veggies, and just about everything. Lots of free plans on our SCInet Wiki. http://www.solarcookers.org Also lots of homemade ideas on YouTube. Good luck. Can’t wait to hear when you get cooking! That looks like a great solar resource, and not just for cooking. I would be surprised if someone hasn’t put on a similar festival in India. I met a woman at the festival who teaches people in her village there how to cook using a parabolic cooker (very similar to the dish cooker in the link you sent). She said she had taught 500 people! Thanks for sharing this! We actually have a solar cooker (still in the box) that I bought for our earthquake kit when we still lived in L.A. Of course, California gets plenty of sun year ’round so it kind of made more sense there, I guess… After Hurricane Sandy, tho, I feel that a “natural disaster kit” is not a bad idea anywhere!!! It was fun and so educational. And the participants were very inspiring. Hi. Mark your calendar! 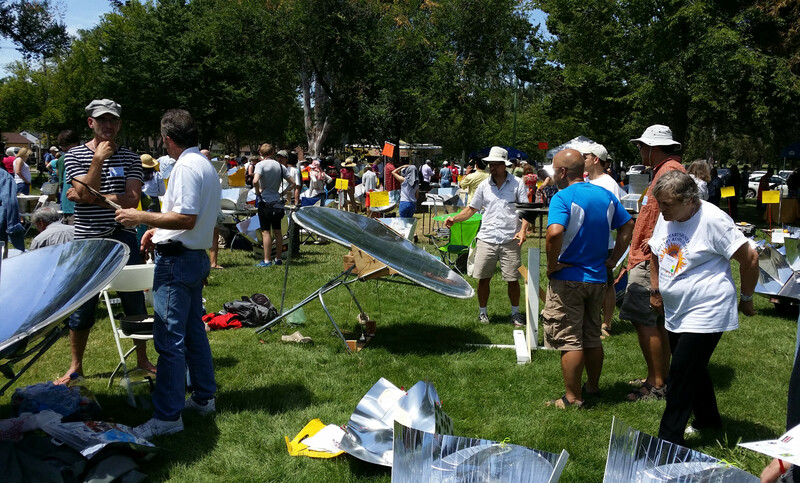 We will be having our Sacramento Solar Cooking Festival again this year. Saturday, July 18th, at William Land Park in Sacramento. 10am-3pm. Free to the public. I hope you will consider being a solar chef at the event! Please help us spread the word. Thank you so much for letting me know! I’ll plan on attending and will spread the word too. 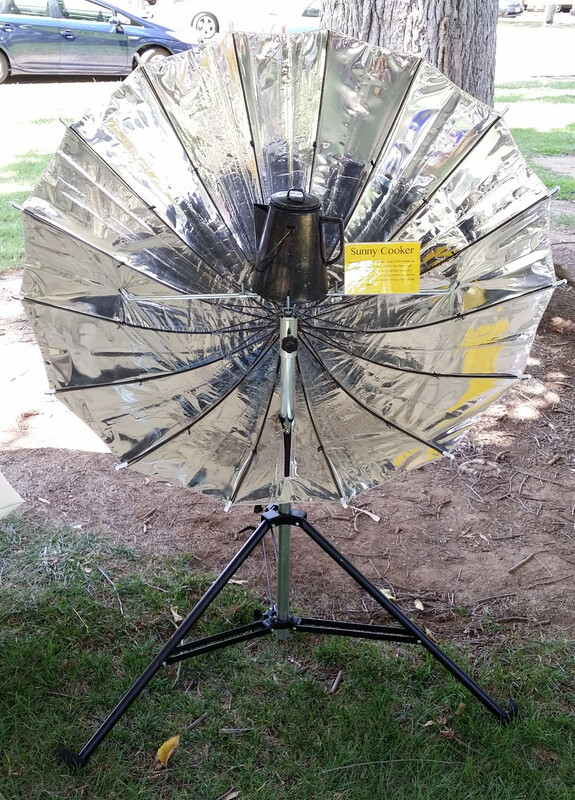 I still don’t have a solar cooker but I have been using a solar food dryer my neighbor built. Gets up to 200 degrees. Could I demo with that? If not, I will just have to build myself a cooker. I’d LOVE to be a solar chef this year! All types of solar cookers are welcome! I think the variety of cookers and the variety of foods being cooked is what made last year’s festival so interesting. Your neighbor’s solar food dryer would be great… bring your neighbor, too! Hopefully you will have time to make your own solar cooker before July. 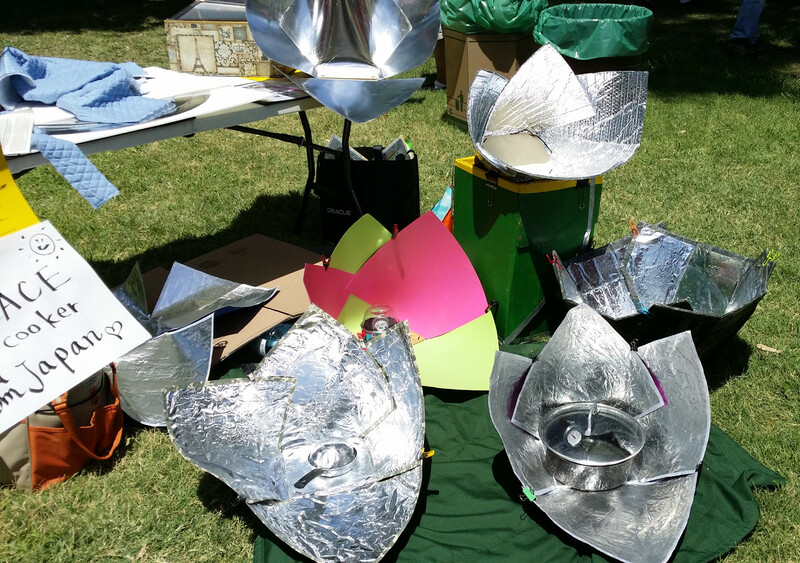 Just a reminder that our next Solar Cooking Festival is coming right up! Saturday, July 18th. I hope to see you there again! Thank you for letting me know. What time does it start? Hope to see you there! You took such great photos last year. Will it be OK if I use some of photos from this post in a presentation I’m making for school? I have the newest obsession with utilizing the sun. On the east coast right now it is summer and I have been trying to use every excuse there is to be outside with my one year old. I have been drying the prefolds I hand wash and I just made sun tea for the very first time yesterday. I am going to obsess over this solar oven for a long time! Thank you for this post!